Lampworking is a type of glasswork that uses a gas fueled torch to melt rods and tubes of clear and colored glass. Once in a molten state, the glass is formed by blowing and shaping with tools and hand movements. 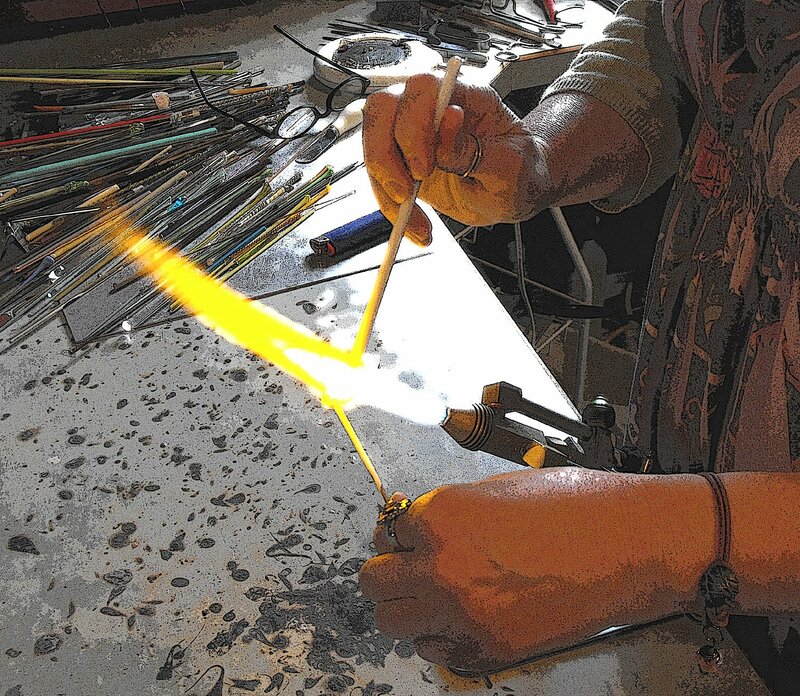 It is also known as flameworking or torchworking, as the modern practice no longer uses oil-fueled lamps. Although the art form has been practiced since ancient Syrian (1 Century B.C., B. Dunham) times, it became widely practiced in Murano, Italy in the 14th century. In the mid 19th century lampwork technique was extended to the production of paperweights, primarily in France, where it became a popular art form, still collected today. Lampworking differs from glassblowing in that glassblowing uses a blowpipe to inflate a glass blob known as a gob or gather, thereby inflating it by blowing air into the blowpipe, whereas lampworking manipulates glass either by the use of tools, gravity, or by blowing directly into the end of a glass tube. Early lampworking was done in the flame of an oil lamp, with the artist blowing air into the flame through a pipe. Most artists today use torches that burn either propane or natural gas, or in some countries butane, for the fuel gas, with either air or pure oxygen (which can be produced by an oxygen concentrator) as the oxidizer. Many hobbyists use MAPP gas in portable canisters for fuel. Lampworking is used to create artwork, including figurines, trinkets, curios, Christmas tree ornaments, beads and much more. It is also used to create scientific instruments as well as glass models of animal and botanical models. You are currently reading >The art of Lampwork at fireandglass.